We need to plot the points (1, 4), (2, 3), (3, 35), (4, 63), (5, 87), (6, 99), (7, 107), (8, 113), (9, 118), (10, 120), by taking upper class limit over the x-axis and cumulative frequency over the y-axis. Plot the points (640, 16), (680, 61), (720, 217), (760, 501), (800, 673), (840, 732), (880, 750) by taking upper class limit over the x-axis and cumulative frequency over the y-axis. Plot the points (4.5, 2), (9.5, 8), (14.5, 18), (19.5, 23), (24.5,26) by taking the upper class limit over the x-axis and cumulative frequency over the y-axis. 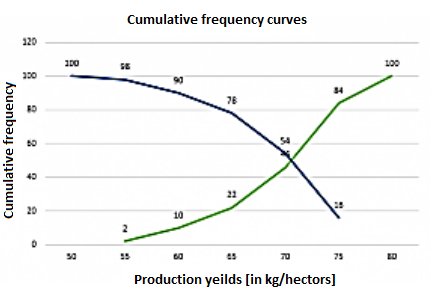 Convert the above distribution to a 'less than' type cumulative frequency distribution and draw its ogive. 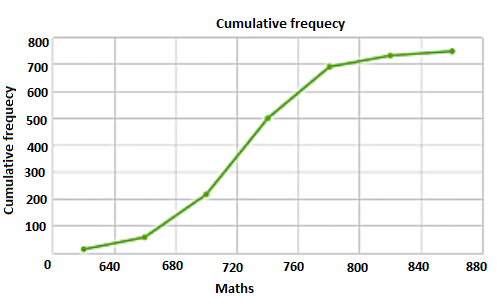 Now we mark on x-axis upper class limit, y-axis cumulative frequencies. Thus we plot the point (120, 12), (140, 26), (160, 34), (180, 40), (200, 50). 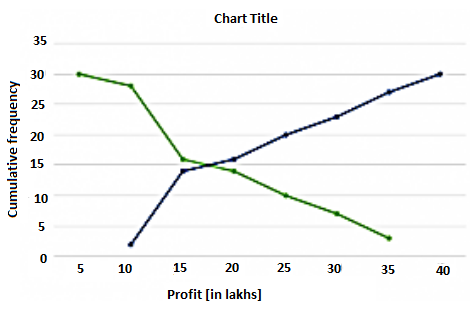 Draw a less than type ogive for the given data. 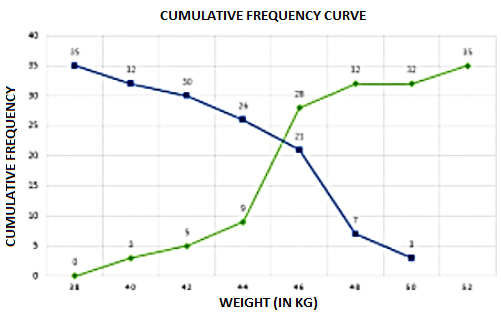 Hence, obtain the median weight from the graph and verify the verify the result my using the formula. 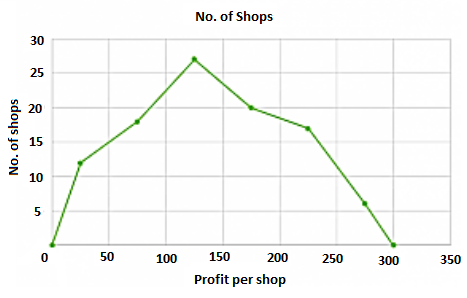 Less than method: It is given that On x-axis upper class limits. Y-axis cumulative frequency We plot the points (38, 0), (40, 3), (42, 5), (44, 9), (46, 4), (48, 28), (50, 32), (52, 35). 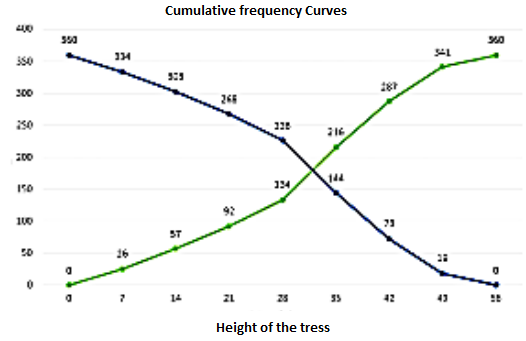 x – axis lower class limits on y-axis cf We plot the points (38, 35), (40, 32), (42, 30), (44, 26), (46, 26), (48, 7), (50,3). 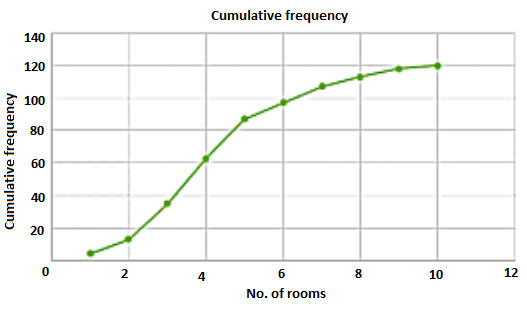 Plot the points (7, 26), (14, 57), (21, 92), (28, 134), (35, 216), (42, 287), (49, 341), (56, 360) by taking upper class limit over the x-axis and cumulative frequency over the y-axis. 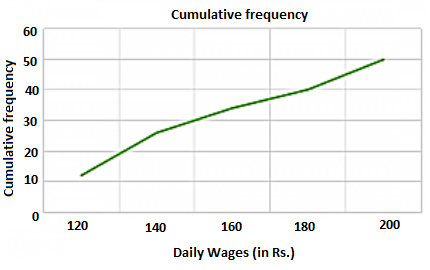 Draw both ogive for the above data and hence obtain the median. 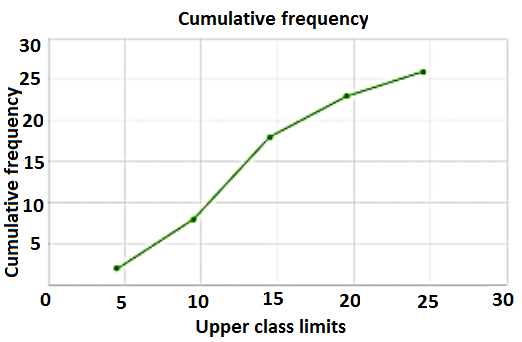 Now we mark the upper class limits along x-axis and cumulative frequency along y-axis. Thus we plot the points (10, 2), (15,14), (20,16), (25, 20), (30, 23), (35, 27), (40, 30).